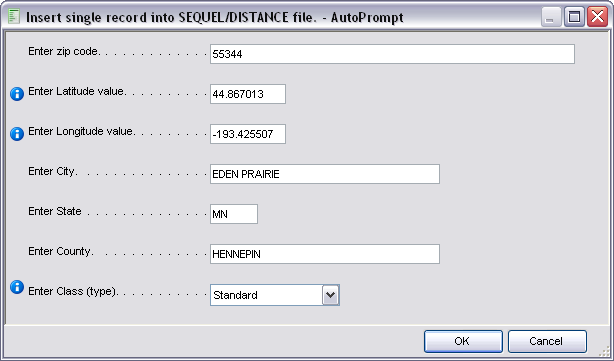 A file (SEQUEL/DISTANCE) containing U.S. Zip Codes and associated latitude and longitude data is shipped with Sequel for use with the DIST_xxx functions. This file has been updated a final time (March 2012) as this information is not as readily available as it has been in the past. It contains 42,604 U.S. Zip Codes covering North America, the U.S. Virgin Islands, Guam, and American Samoa. 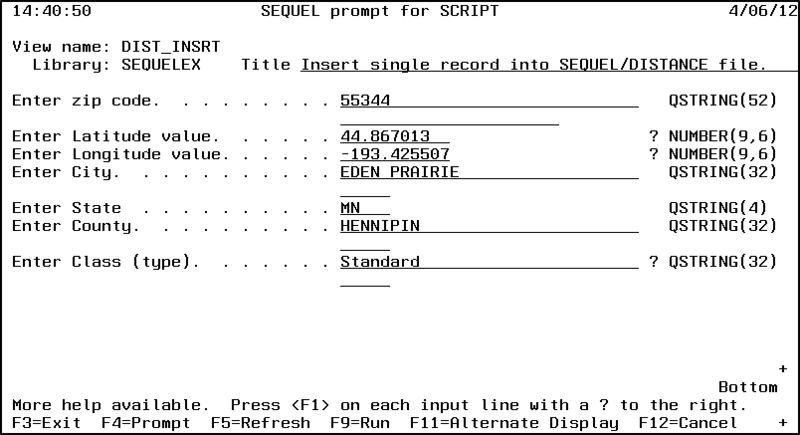 Although we will not update this file in future versions of Sequel, you can easily maintain and add new records to the file using the INSERT command, or a new script—DIST_INSRT—included in the SEQUELEX library. Zip Codes and their associated latitude and longitude values can easily be found with a simple Google search. The DIST_INSRT script can be run from the ViewPoint Explorer (the list of ViewPoint objects), or from a command line. In ViewPoint, navigate to the SEQUELEX library and double-click the script to run. You will be presented with a run-time prompt screen where you will input the values to create a new record in the file. Or, from a command line issue the command RUNSCRIPT SCRIPT(SEQUELEX/DIST_INSRT) to display a similar run-time prompt screen. Enter your values and press OK in ViewPoint or F9 in green screen to add the new record.